I really didn’t even know what to call this as you can tell by my extremely boring and unoriginal title. Maybe after reading the recipe you can come up with a better name?? I’ll gladly change it because my creativity level at 7:30 in the morning is obviously at an all time low! This is a great low-carb meal that doesn’t take much time to make (besides baking the squash) and you can pretty much throw whatever veggies you have into the ground beef. It’s a great way to use up those 5 lonely green beans or half a zucchini that are about to go to the veggie graveyard. I had some sweet mini peppers on hand so I decided to toss those in there, but this would work great with bell peppers, zucchini, carrots, corn, mushrooms, green beans, etc. Instead of using rice or pasta (which looking at my recent recipes I obviously need a break from) I used spaghetti squash which makes you think you’re eating carbs but a-ha!! You’re not! Sneaky, sneaky! Preheat an oven to 375 degrees. Cut the squash in half lengthwise. If you’re having trouble cutting it, place it in the microwave for 30 seconds or so. Scoop out the seeds with a spoon and then place in a casserole dish cut side down in about an inch of water. Bake for about 30-40 minutes. This will depend on your oven temp and also how big the squash is. Check it with a knife. If the knife goes in the skin easily then you know it’s done. Once it’s done, scrape the inside of the squash with a fork and the strands should just come right off! Season with a pad of butter and salt and pepper. In a pan over medium heat saute your onion for about 3 minutes and then toss in your peppers and garlic. Let this all cook for about 5 minutes and then put in your ground beef. Make sure to use extra lean ground beef so you don’t get a lot of oil. Season with cumin, complete seasoning, salt, and pepper. Oh my! That sounds amazing!! 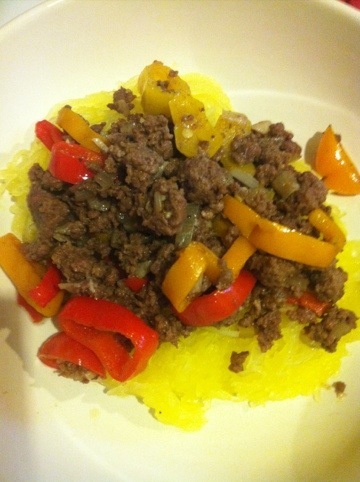 Spaghetti squash is great, so versatile and really easy to make!